DES MOINES - Iowa Barnstormers Head Coach and Director of Football Operations John Gregory announced this morning that the Arena Football league franchise has reached agreement with rookie defensive back Cameron McGlenn. 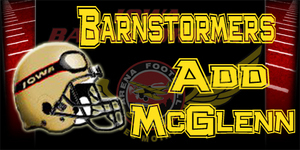 McGlenn (6-0, 187) will begin his Arena Football career with the Barnstormers following four years at Elon University (NC). While at Elon, McGlenn participated in 37 career games, recording 5 interceptions. He also was a standout on special teams and considered one of the team's leaders in the locker room. Upon graduation last May, McGlenn joined the Fayetteville Guard of the AIFA for their final three home games of the 2010 season.